Hippocrates was a Greek doctor. He was probably born in 460 BC, and died in 377 BC. Hippocrates is called the "father of medicine". He was the first person to write that people got sick for scientific reasons. People used to believe disease was caused by angry (mad) gods. 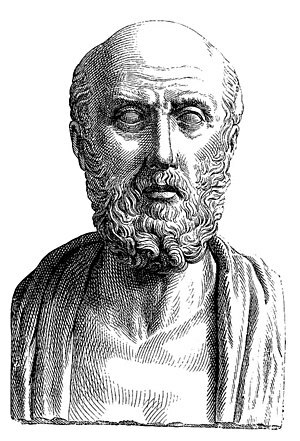 Hippocrates wrote about treating sick people. His writings are still important to doctors today. He said many ideas that doctors still study. An idea he wrote about is "patient confidentiality". This means that doctors cannot tell anyone else what their patients tell them. Another idea is that the doctor cannot do anything to kill a patient. These kinds of ideas are part of medical ethics. Most medical schools today use a new version. This means that some things are changed. But the important ideas are the same. This is an example of a modern Hippocratic Oath. This is used today at the University of North Carolina School of Medicine. these things I do promise and in proportion as I am faithful to this oath, may happiness and good repute be ever mine, but should I trespass and violate this oath, may the reverse be my lot. This page was last changed on 31 March 2014, at 16:10.